Our vision is to experience the joy of creating smiles for people through gentle excellence in dentistry, and building life-long relationships based on integrity, trust and care. Everyone deserves a beautiful smile. We practice a total approach to oral health. We do not just treat immediate issues, but aim to provide our patients with lifelong oral health. 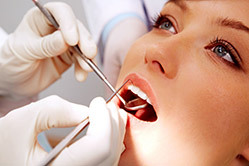 We discuss all treatment options prior to commencing and present a written personalized dental plan for all patients. We consider ourselves your dental consultants. Our role is to discover your needs, wants and desires, combined with our dental services to provide you with a solution. We will take into consideration your goals, health concerns, functional issues and cosmetic desires. In doing so, we create a Personalized Dental Plan for you that we will refer back to at each of your visits. We can alter or sequence it to accommodate your specific needs. We create beautiful smiles through gentle excellence in dentistry, utilizing the latest advanced techniques. We choose every member of our team based on their individual ability to care for our patients. From noise reduction headphones to our DVD library, magazines and neck pillows, the dental experience we offer is first class. To be grateful every day for the opportunity to help others. To give back to the community. To use our skills to benefit communities in less developed countries.